"Bisaya" redirects here. For the ethnic group found in Borneo, see Bisaya (Borneo). The Visayans (Visayan: Mga Bisaya; local pronunciation: [bisaja]) is an umbrella term for the Philippine ethnolinguistic groups native to the whole Visayas, the southernmost islands of Luzon and most parts of Mindanao. Those particularly within the Visayas broadly share a sea-based culture with strong Roman Catholic traditions merged with cultural elements through centuries of interaction and inter-migrations mainly across the seas of Visayan, Sibuyan, Camotes and Bohol, and in some secluded areas merged with ancient animistic-polytheistic influences (i.e. Folk Catholicism). Most Visayans are speakers of one or more Visayan languages, the most widely spoken being Cebuano, closely followed by Hiligaynon (Ilonggo) and Waray-Waray. Many have, at some point in their lives, migrated to Metro Manila and its surrounding provinces out of necessity brought about by the negative effects of economic centralization in their nation. They comprise the largest grouping in the geographical division of the country, numbering at around 33 million as of 2010. Kabisay-an refers both to the Visayan people collectively and the islands they have inhabited since prehistory. The Anglicized term Visayas (adapted from the, in turn, Hispanized Bisayas) is commonly used to refer to the latter. In Northern Mindanao, Visayans (both Mindanao natives and migrants) are also referred to by the Lumad as the dumagat ("sea people", not to be confused with the Dumagat Aeta). This was to distinguish the coast-dwelling Visayans from the Lumad of the interior highlands and marshlands. According to H. Otley Beyer and other anthropologists, the term Visayan (Spanish: bisayo) was first applied only to the people of Panay and to their settlements eastward in the island of Negros, and northward in the smaller islands, which now compose the province of Romblon. In fact, at the early part of Spanish colonialization of the Philippines, the Spaniards used the term Visayan only for these areas, while the people of Cebu, Bohol, and western Leyte were for a long time known only as Pintados. The name Visayan was later extended to them around the beginning of 1800s because, as several of the early writers state (especially in the writings of the Jesuit Lorenzo Hervás y Panduro published in 1801), albeit erroneously, their languages are closely allied to the Visayan "dialect" of Panay. The impression of these similarities was in fact carefully analyzed by David Zorc, who, while able to linguistically classify the Austronesian subfamily termed Visayan languages, noticed their overall connections as one dialect continuum. These should not, however, be confused as dialects, given the lack of mutual intelligibility. Grabiel Ribera, captain of the Spanish royal infantry in the Philippine Islands, also distinguished Panay from the rest of the Pintados Islands. In his report (dated 20 March 1579) regarding a campaign to pacify the natives living along the rivers of Mindanao (a mission he received from Dr. Francisco de Sande, Governor and Captain-General of the Archipelago), Ribera mentioned that his aim was to make the inhabitants of that island "vassals of King Don Felipe ... as are all the natives of the island of Panay, the Pintados Islands, and those of the island of Luzon ..."
The Visayans first encountered Western Civilization when Portuguese explorer Ferdinand Magellan reached the island of Homonhon, Eastern Samar in 1521. The Visayas became part of the Spanish colony of the Philippines and the history of the Visayans became intertwined with the history the Philippines. With the three centuries of contact with the Spanish Empire via Mexico and the United States, the islands today share a culture tied to the sea later developed from an admixture of indigenous lowland Visayans, Han Chinese, Indian, Hispanic and American influences. The 16th century marks the beginning of the Christianization of the Visayan people, with the baptism of Rajah Humabon and about 800 native Cebuanos. The Christianization of the Visayans and Filipinos in general, is commemorated by the Ati-Atihan Festival of Aklan, the Dinagyang Festival of Iloilo, and the Sinulog festival the feast of the Santo Niño de Cebu (Holy Child of Cebu), the brown-skinned depiction of the Child Jesus given by Magellan to Rajah Humabon's wife, Hara Amihan (baptized as Queen Juana). By the 17th century, Visayans already took part in religious missions. In 1672, Pedro Calungsod, a teenage indigenous Visayan catechist and Diego Luis de San Vitores, a Spanish friar, were both martyred in Guam during their mission to preach Christianity to the Chamorro people. By the end of the 19th century, the Spanish Empire weakened after a series of wars with its American colonies. The surge of newer ideas from the outside world thanks to the liberalization of trade by the Bourbon Spain fostered a relatively larger middle class population called the Ilustrados or "the Enlightened Ones." This then became an incentive for the new generation of educated political visionaries to fulfill their dreams of independence from three centuries of colonial rule. Some prominent leaders of the Philippine Revolution in the late 19th century were Visayans. Among leaders of the Propaganda movement was Graciano López Jaena, the Ilonggo who established the propagandist publication La Solidaridad (The Solidarity). In the Visayan theater of the Revolution, Pantaleón Villegas (better known as León Kilat) led the Cebuano revolution in the Battle of Tres de Abril (April 3). One of his successors, Arcadio Maxilom, is a prominent general in the liberalization of Cebu. Earlier in 1897, Aklan fought against the Spaniards with Francisco Castillo and Candido Iban at the helm. Both were executed after a failed offensive. Martin Delgado and Juan Araneta led the rebellion in neighboring Iloilo. With the assistance of Aniceto Lacson, Negros Occidental was freed while Negros Oriental was liberated by Diego de la Viña. The latter would be called the Negros Revolution or the Cinco de Noviembre. Movements in Capiz were led by Esteban Contreras with the aid of Alejandro Balgos, Santiago Bellosillo and other Ilustrados. Meanwhile, Leandro Locsin Fullon spearheaded the liberalization of Antique. Most of these revolutionaries would continue their fight for independence until the Philippine–American War. There was also a less heard and short-lived uprising called the Igbaong Revolt which occurred in Igbaong, Antique steered by Maximo and Gregorio Palmero. This revolt, however, was secularly-motivated as they clamored for a more syncretic form of religion based on Visayan animist traditions and Christianity. The federation was immediately formed upon the merger of the Cantonal Government of Negros, the Cantonal Government of Bohol and the Provisional Government of the District of Visayas (based in Panay) which included Romblon. It was said to be based on American federalism and Swiss confederacy. Despite their skepticism towards Malolos, the Visayan government proclaimed its loyalty to the Luzon-based republic while maintaining their own governance, tax collection and army. Apolinario Mabini, then the prime minister of the Malolos republic convinced the Visayan leaders that the Malolos Constitution was only provisional and that the governments in Visayas and Mindanao were promised the power to co-ratify it. A Map of Mindanao c. 1900, made by the US Army in the Philippines, showing the different ethnic groups of Mindanao, and their respective Ancestral Domains and traditional homeland. Most of the northern and eastern, as well as some southern coastal regions have been traditional homeland of Visayans; Islamized tribes dominate the western and some southern coasts; and the Lumads have been dwelling in the inland and highlands. After the 1898 Treaty of Paris, the American colonial government saw the integral part of indigenous elites particularly in Negros in local affairs. This was a different move compared to the previous Spanish imperialists who created a racial distinction between mestizos and native Austronesians (indios). As such, this paved the way for a homogenous concept of a Filipino albeit initially based on financial and political power. These said elites were the hacienderos or the landed, bourgeois-capitalist class concentrated within the sugar cane industry of Negros. The Americans' belief that these hacienderos would be strategic elements in their political hold within the newly acquired colony bolstered the drafting of a separate colonial constitution by and for the sugar industry elites. This constitution likewise established the Negros Cantonal Government. This ensured that the island of Negros would be governed by an indigenous civilian government in contrast to the rest of colonist-controlled areas governed by the American-dominated Philippine Commission. During this period, the eastern islands of Samar, Leyte and Biliran (including Marinduque) were directly governed by the Malolos Republic through Vicente Lukban and later by Ambrosio Mojica. Meanwhile, prior to the full abolition of the federal government on November 12, 1899, Emilio Aguinaldo appointed Martin Delgado as the civil and military governor of Iloilo on April 28, 1899 upon American invasion of Antique. The federal government, much to its rejection of the Cebuano leaders who supported the Katipunan cause, was dissolved upon the Iloilo leaders' voluntary union with the newly formed First Philippine Republic. Other factors which led to Aguinaldo forcing the Visayans to dissolve their government was due to the federation's resistance from reorganizing its army and forwarding taxes to Malolos. Since Philippine independence from the United States, there have been three Philippine Presidents from the Visayan regions: the Cebuano Sergio Osmeña, the Capiznon Manuel Roxas and the Boholano Carlos P. García. In addition, the Visayas has produced three Vice-Presidents, four Senate Presidents, eight Speakers of the House, six Chief Justices, and five Presidential Spouses including Imelda Marcos, a Waray. The then-president Gloria Macapagal Arroyo is also half Cebuano. Current president Rodrigo Duterte, who is of Visayan ethnicity, also has Cebuano roots. In international diplomacy the Visayas has produced a United Nations Undersecretary general, the Negros Occidental native Rafael M. Salas who served as the Head of the UNFPA. In the lines of religion, there have been two Visayan Cardinals, namely Julio Rosales from Samar and Jaime Sin from Aklan. The first Visayan and second Filipino that was canonized is Pedro Calungsod. Throughout centuries, non-Visayan groups, most notably foreigners such as the Chinese, have settled in predominantly-Visayan cities in Visayas like Iloilo, Bacolod, Dumaguete and Cebu and Mindanao such as Cagayan de Oro, Iligan, Davao and General Santos. These Filipino-Chinese have been assimilated to mainstream society. One factor would be the limited number of Chinese schools in the Visayas which help maintain the Chinese identity and a stronger sense of a distinct community. Many of them, particularly the younger generation, have been de-cultured from Chinese traditions, share values about family and friends with other Filipinos, and do not write or speak Chinese well. Meanwhile, Negritos, locally called Ati, have also been assimilated into mainstream Visayan society. Visayans have likewise migrated to other parts of the Philippines, especially Metro Manila and Mindanao. The Visayans have also followed the pattern of migration of Filipinos abroad and some have migrated to other parts of the world starting from the Spanish and American period and after World War II. Most are migrants or working as overseas contract workers. 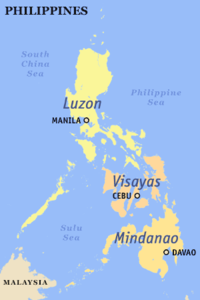 Map of the Philippines showing the locations of Visayas, Mindanao and Luzon divisions. Note that the culturally and linguistically Visayan provinces of Masbate, Palawan and Romblon are not usually geographically included in common literature due to the fact that the former is under Bicol Region and the latter two are under MIMAROPA, both Luzon-associated administrative regions, respectively. Ethnic Visayans predominantly speak at least one of the Visayan languages which are commonly referred as Binisaya or Bisaya. The table below lists the Philippine languages classified as Visayan by the Summer Institute of Linguistics. Although all of the languages indicated below are classified as "Visayan" by linguistic terminology, not all speakers identify themselves as ethnically or culturally Visayan. The Tausūg, a Moro ethnic group, only use Bisaya to refer to the predominantly Christian lowland natives which Visayans are popularly recognized as. This is a similar case to the Ati, who delineate Visayans from fellow Negritos. Conversely, the Visayans of Capul in Northern Samar speak Abaknon, a Sama–Bajaw language, as their native tongue. 2 Philippines only; 1,022,000 worldwide. Prior to the arrival of Catholicism, precolonial Visayans adhered to a complex Hindu-Buddhist and animist system where spirits in nature were believed to govern all existing life. Similar to other ethnic groups in the Philippines such as the Tagalogs who believed in a pantheon of gods, the Visayans also adhered to deities led by a supreme being. Such belief, on the other hand, was misinterpreted by arriving Spaniards such as Jesuit historian Pedro Chirino to be a form of monotheism. There are Kaptan and Magwayan, supreme god of the sky and goddess of the sea and death, respectively. They in turn bore two children, Lihangin, god of wind, and Lidagat, goddess of the sea. Both aforementioned gods had four children, namely Likabutan, the god of the world, Liadlaw, the god of the sun, Libulan, the god of the moon, and Lisuga, the goddess of the stars. People believed that life transpires amidst the will of and reverence towards gods and spirits. These deities who dwell within nature were collectively called the diwata. Meanwhile, spirits were referred to as umalagad (called anito in Luzon). These refer to ancestors, past leaders or heroes also transfigured within nature. Beside idols symbolizing the umalagad were food, drinks, clothing, precious valuables or even a sacrificial animal offered for protection of life or property. Such practice was a form of ancestor worship. Furthermore, these rituals surrounding the diwata and umalagad were mediated by the babaylan who were highly revered in society as spiritual leaders. These intercessors were equivalent to shamans, and were predominantly women or were required to have strong female attributes such as hermaphrodites and homosexuals. Old men were also allowed to become one. One notable example is Dios Buhawi who ruled a politico-religious revolt in Negros Oriental at the beginning of the Philippine Revolution. According to 2000 survey, 86.53% of the population of Western Visayas professed Roman Catholicism. Aglipayan (4.01%) and Evangelicals (1.48%) were the next largest groups, while 7.71% identified with other religious affiliations. The same survey showed that 92% of household populations in Central Visayas were Catholics, followed by Aglipayans (2%) and Evangelicals (1%). The remaining 5% belonged to the United Church of Christ in the Philippines, Iglesia ni Cristo, various Protestant denominations or other religions. For Eastern Visayas, 93% of the total household population were Catholics, while 2% identified as "Aglipayan", and 1% as "Evangelical". The remaining 15% belonged to other Protestant denominations (including the Iglesia ni Cristo, the Seventh-day Adventist Church, and various Baptist churches) or identified with Islam and other religions. Visayans are known in the Philippines for their festivities such as the Ati-atihan, Dinagyang, Pintados-Kasadyaan, Sangyaw, Sinulog festivals. Most Visayan festivals have a strong association with Roman Catholicism despite apparent integration of ancient Hindu-Buddhist-Animist folklore particularly the tradition of dances and the idols in the image of the Child Jesus commonly named as the Santo Niño. The oldest Catholic religious image in the islands still existing today is the Santo Niño de Cebú. The Sandugo Festival of Tagbilaran, Bohol is a celebration of one of the most significant parts of pre-Philippine history. This festival revolves around the theme of the reenactment of the blood compact between the island's monarch, Datu Sikatuna, and the Spanish explorer, Miguel López de Legazpi, which is known among Filipinos as the Sandugo. The arrival of the ten Bornean datus as mentioned in the legend of Maragtas is celebrated in Binirayan Festival in Antique. The MassKara Festival of Bacolod, Negros Occidental explores more on the distinct cultural identity of the city. Since Bacolod is tagged as the City of Smiles due to its fun-loving and enduring people, the city government inaugurated the festival in 1980 after tragedy struck the region. Some of the earliest known works were documented by a Spanish Jesuit named Ignacio Francisco Alzina during the Spanish colonial Philippines. Among these literary pieces from ancient Eastern Visayas were candu, haya, ambahan, canogon, bical, balac, siday and awit which are predominantly in Waray. There were also narratives called susmaton and posong. It was also described that theater played a central role in performing poetry, rituals and dances. The Western Visayans also shared nearly the same literary forms with the rest of the islands. Among their pre-Hispanic works were called the bangianay, hurobaton, paktakun, sugidanun and amba. These were all found to be in Old Kinaray-a. Some of the widely known and the only existing literature describing ancient Visayan society are as the Hinilawod and the Maragtas which was in a combination of Kinaray-a and Hiligaynon. The Aginid: Bayok sa Atong Tawarik is an epic retelling a portion of ancient Cebu history where the Chola dynasty minor prince Sri Lumay of Sumatra founded and ruled the Rajahnate of Cebu. It also has accounts of Rajah Humabon and Lapu-Lapu. It was found by Filipino polymath José Rizal in Antonio de Morga's Sucesos delas islas Filipinas that one of the first known native poet in much of pre-Philippines known to Europeans was a Visayan named Karyapa. During the golden age of native Philippine languages at the onset of Japanese occupation, numerous Visayan names rose to literary prominence. Acclaimed modern Visayan writers in their respective native languages are Marcel Navarra, the father of modern Cebuano literature, Magdalena Jalandoni, Ramon Muzones, Iluminado Lucente, Francisco Alvardo, Eduardo Makabenta, Norberto Romuáldez, Antonio Abad, Augurio Abeto, Diosdado Alesna, Maragtas S. V. Amante, Epifanio Alfafara, Jose Yap, Leoncio P. Deriada, Conrado Norada, John Iremil Teodoro and Peter Solis Nery. Don Ramon Roces of Roces Publishing, Inc. is credited for the promulgation of Visayan languages in publications through Hiligaynon and Bisaya. Visayan films, particularly Cebuano-language ones, experienced a boom between the 1940s and the 1970s. In the mid 1940s alone, a total of 50 Visayan productions were completed, while nearly 80 movies were filmed in the following decade. This wave of success has been bolstered by Gloria Sevilla, billed as the "Queen of Visayan Movies", who won the prestigious Best Actress award from the 1969 FAMAS for the film Badlis sa Kinabuhi and the 1974 Gimingaw Ako. Caridad Sanchez, Lorna Mirasol, Chanda Romero, Pilar Pilapil and Suzette Ranillo are some of the industry's veterans who gained recognition from working on Visayan films. The national film and television industries are also supported by actors who have strong Visayan roots such as Joel Torre, Jackie Lou Blanco, Edu Manzano, Manilyn Reynes, Dwight Gaston, Vina Morales, Sheryl Reyes, and Cesar Montano, who starred in the 1999 biographical film Rizal and multi-awarded 2004 movie Panaghoy sa Suba. Younger actors and actress of Visayan origin or ancestry include Isabel Oli, Kim Chiu, Enrique Gil, Shaina Magdayao, Carla Abellana, Erich Gonzales and Matteo Guidicelli. Award-winning director Peque Gallaga of Bacolod has garnered acclaim from his most successful movie Oro, Plata, Mata which depicted Negros Island and its people during World War II. Among his other works and contributions are classic Shake, Rattle & Roll horror film series, Scorpio Nights and Batang X.
GMA Network's 2011 period drama teleserye Amaya as well as its 2013 series Indio, featured the politics and culture of ancient and colonial Visayan societies, respectively. Traditional Visayan folk music were known to many such as Dandansoy originally in Hiligaynon and is now commonly sang in other Visayan languages. Another, although originally written in Tagalog, is Waray-Waray, which speaks of the common stereotypes and positive characteristics of the Waray people. American jazz singer Eartha Kitt also had a rendition of the song in her live performances. A very popular Filipino Christmas carol Ang Pasko ay Sumapit translated by Levi Celerio to Tagalog was originally a Cebuano song entitled Kasadya Ning Taknaa popularized by Ruben Tagalog. Tinikling, which presumably originated from the Samar-Leyte area in Eastern Visayas. Contemporary Philippine music was highly influenced and molded through the contributions of many Visayan artists. Many of them are platinum recorder Jose Mari Chan, Pilita Corrales, Dulce, Verni Varga, Susan Fuentes, Jaya and Kuh Ledesma who have enjoyed acclaim around the 60's to the early 90's. Newer singers are Jed Madela, Sheryn Regis and Sitti Navarro. Yoyoy Villame, a Boholano, is dubbed as the Father of Filipino novelty songs with his Butsekik as the most popular. Villame often collaborated with fellow singer, Max Surban. Joey Ayala, Grace Nono and Bayang Barrios are some of the front-runners of a branching musical subgenre called Neotraditional which involved traditional Filipino instruments with modern rhythm and melody. Rock emerged into dominance within the Philippine music scene in the 80's. Among the bands from Visayas are Urbandub and Junior Kilat. Another subgenre also sprung a few years later called BisRock which is a portmanteau of Bisaya and rock. Ethnic dances from the region are common in any traditional Filipino setting. Curacha or kuratsa (not to be confused with the Zamboangueño dish) is a popular Waray dance. Its Cebuano counterparts are kuradang and la berde. There is the liki from Negros Occidental and the well-known tinikling of Leyte. Other Hiligaynon dances are the harito, balitaw, liay, lalong kalong, imbong, inay-inay and binanog. The only Boholano and the youngest to receive the National Artist of the Philippines award for visual arts is Napoleon Abueva. He is also tagged as the Father of Modern Philippine Sculpture. Among his works are Kaganapan (1953), the Transfiguration (1979) and the 14 Stations of the Cross around the EDSA Shrine. He is also responsible for the sculpture of the Sandugo monument at Tagbilaran City to give homage to his roots. A renowned figure in architecture is Leandro Locsin of Silay, Negros Occidental. He was proclaimed as National Artist of the Philippines for architecture in 1990. Locsin worked on many of the buildings in many campuses of the University of the Philippines System. He also designed the main building or the Tanghalang Pambansa of the Cultural Center of the Philippines and the Ayala Tower One & Exchange Plaza housing the Philippine Stock Exchange at Makati. ^ a b "Central Visayas: Three in Every Five Households had Electricity (Results from the 2000 Census of Population and Housing, NSO)". National Statistics Office, Republic of the Philippines. July 15, 2003. Archived from the original on February 21, 2012. Retrieved September 4, 2012. ^ G. Nye Steiger, H. Otley Beyer, Conrado Benitez, A History of the Orient, Oxford: 1929, Ginn and Company, pp. 122–123. ^ "... and because I know them better, I shall start with the island of Cebu and those adjacent to it, the Pintados. Thus I may speak more at length on matters pertaining to this island of Luzon and its neighboring islands..." BLAIR, Emma Helen & ROBERTSON, James Alexander, eds. (1903). The Philippine Islands, 1493–1803, Volume 05 of 55 (1582–1583), p. 35. ^ Cf. Maria Fuentes Gutierez, Las lenguas de Filipinas en la obra de Lorenzo Hervas y Panduro (1735-1809) in Historia cultural de la lengua española en Filipinas: ayer y hoy, Isaac Donoso Jimenez,ed., Madrid: 2012, Editorial Verbum, pp. 163-164. ^ Zorc, David Paul. 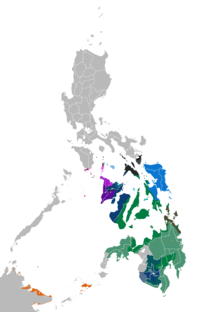 The Bisayan Dialects of the Philippines: Subgrouping and Reconstruction. Canberra, Australia: Dept. of Linguistics, Research School of Pacific Studies, Australian National University, 1977. ^ Cf. BLAIR, Emma Helen & ROBERTSON, James Alexander, eds. (1911). The Philippine Islands, 1493–1803. Volume 04 of 55 (1493–1803). Historical introduction and additional notes by Edward Gaylord BOURNE. Cleveland, Ohio: Arthur H. Clark Company. ISBN 978-0-554-25959-8. OCLC 769945704. "Explorations by early navigators, descriptions of the islands and their peoples, their history and records of the catholic missions, as related in contemporaneous books and manuscripts, showing the political, economic, commercial and religious conditions of those islands from their earliest relations with European nations to the beginning of the nineteenth century. ", pp. 257–260. ^ Francisco Ignacio Alcina (1668). Historia de las islas e indios de Bisayas. ^ Bernad, Miguel (2002). "Butuan or Limasawa? The site of the first mass in the Philippines: A reexamination of the evidence". 3 (6). Budhi: 133–166. Retrieved 17 April 2014. ^ Cebu Daily News (2009-02-26). "One Visayas is here!". Inquirer.net. Archived from the original on December 16, 2009. Retrieved 2013-12-28. ^ Nath Hermosa (2011-08-24). "A Visayan reading of a Luzon artifact". Retrieved 2013-12-28. ^ Medina, A.; Pulumbarit V. (18 October 2012). "A primer: Life and works of Blessed Pedro Calungsod". Retrieved 18 April 2015. ^ Panubilon (12 June 2003). "Aklan". Archived from the original on May 4, 2012. Retrieved 8 September 2012. ^ Go Dumaguete! (2009). "A brief history of Negros Occidental". Archived from the original on 8 December 2012. Retrieved 8 September 2012. ^ Clavel, Leothiny (1995). "Philippine Revolution in Capiz". Diliman Review. 43 (3–4): 27–28. ^ Funtecha, H. F. (15 May 2009). "The great triumvirate of Capiz". The News Today. Retrieved 8 September 2012. ^ Funtecha, Henry (16 May 2007). "The Babaylan-led revolt in Igbaong, Antique". The News Today. Retrieved 8 September 2012. ^ Mateo, G. E. C. (2001). "The Philippines: A story of a nation" (PDF). Honolulu: University of Hawai'i at Manoa. ^ Velmonte, J. M. (2009). "Ethnicity and revolution in Panay". Kasarinlan. 14 (1). ^ Serag, S. S. C. (1997). The Remnants of the Great Ilonggo Nation. Manila: Rex Book Store. ^ Aguilar, F. (2000). "The Republic of Negros". Philippine Studies. 48 (1). ^ Zaide, G. F. (1954). The Philippine Revolution. Manila: Modern Book Company. ^ a b Aguilar, F. V. (1998). Clash of Spirits: The History of Power and Sugar Planter Hegemony on a Visayan Island. Honolulu: University of Hawai'i Press. ^ Nabong-Cabardo, R. (2002). "A revolution unfolds in Samar victory in Balangiga". In Gotiangco, G. G.; Tan, S. K.; Tubangui, H. R. (eds.). Resistance and Revolution: Philippine Archipelago in Arms. Manila: National Commission for Culture and the Arts, Committee on Historical Research. ^ Presidential Museum and Library (11 June 2014). "June 12 and the commemoration of Philippine independence". ^ McAllister Linn, B. (2000). The Philippine War 1899–1901. Lawrence, KS: University of Kansas Press. ^ Mayol, A. V. S. (3 April 2014). "Feast of San Pedro Calungsod: 'Having a saint from the Visayas is not enough'". Retrieved 18 April 2015. ^ Chee, K. T. (2010). Identity and Ethnic Relations in Southeast Asia: Racializing Chineseness. New York: Springer. ^ See, T. A. (1997). The Chinese in the Philippines: Problems and Perspectives. 2. Manila: Kaisa para sa Kaunlaran, Inc.
^ Pinches, M. (2003). H. Dahles; O. van den Muijzenberg (eds.). "Restructuring capitalist power in the Philippines: Elite consolidation and upward mobility in producer services". Capital and Knowledge in Asia: Changing Power Relations. London: Routledge: 64–89. ^ Tilman, R. O (1974). C. J. McCarthy (ed.). "Philippine-Chinese youth – today and tomorrow". Philippine-Chinese Profile: Essays and Studies. Manila: Pagkakaisa sa Pag-unland. ^ Zulueta, J. O. (2007). "I "speak Chinese but ...": Code-switching and identity construction among Chinese-Filipino youth". Caligrama: Journal of Studies and Researches on Communication, Language, and Media. 3 (2). ^ Blanchetti-Revelli, L. (2003). Rosaldo, R. (ed.). "Moro, Muslim, or Filipino? Cultural citizenship as practice and process". Cultural Citizenship in Island Southeast Asia: Nation and Belonging in the Hinterlands. Berkeley & Los Angeles, CA: University of California Press: 44–75. ^ Zaide, G. F. (2006). T. Storch (ed.). "Filipinos before the Spanish conquest possessed a well-ordered and well-thought-out religion". Religions and Missionaries Around the Pacific, 1500–1900. Hampshire, UK: Ashgate Publishing Limited. ^ Abueg, E. R.; Bisa, S. P; Cruz, E. G. (1981). Talindaw: Kasaysayan ng Pantikan sa Pilipino paa sa Kolehiyo at Unibersidad. Merriam & Webster, Inc.
^ Guillermo, A. R. (2012). Historical Dictionary of the Philippines (3rd ed.). Plymouth, UK: Scarecrow Press, Inc.
^ Halili, C. N. (2004). Philippine History. Manila: Rex Bookstore, Inc.
^ Tarling, N. (1992). The Cambridge History of Southeast Asia: Volume 1, from Early Times to c. 1800. Cambridge: Cambridge University Press. ^ "Western Visayas: Eight Percent of the Total Population Were From Western Visayas (Results from the 2000 Census of Population Housing, NSO)". National Statistics Office, Republic of the Philippines. July 15, 2003. Archived from the original on February 21, 2012. Retrieved September 4, 2012. ^ "Eastern Visayas: Population to Increase by 149 Persons Per Day (Results from the 2000 Census of Population and Housing, NSO)". National Statistics Office, Republic of the Philippines. January 17, 2003. Archived from the original on February 21, 2012. Retrieved September 4, 2012. ^ Center for Southeast Asian Studies, Northern Illinois University. "The Ati-Atihan and other West Visayan festivals". Retrieved 8 September 2012. ^ Tadz Portal; Kitz Y. Elizalde (21 January 1999). "Antique revives Binirayan festival". The Philippine Daily Inquirer. ^ Victor N. Sugbo. "The Literature of Eastern Visayas". National Commission for Culture and The Arts, Republic of the Philippines. Archived from the original on November 1, 2012. Retrieved September 4, 2012. ^ Leoncio P. Deriada. "Hiligaynon Literature". National Commission for Culture and The Arts, Republic of the Philippines. Archived from the original on July 28, 2011. Retrieved September 4, 2012. ^ "Western Visayan Pre-Colonial Literature: A Tapestry of Spoken Stories". Amanuensis. December 5, 2009. Retrieved September 4, 2012. ^ Abellana, Jovito (1952). Aginid, Bayok sa Atong Tawarik. Cebu Normal University Museum. ^ Valeros, M. A. E. (13 September 2009). "The Aginid". The Freeman. Archived from the original on 8 February 2013. Retrieved 4 September 2012. ^ Josephil Saraspe (April 3, 2009). "Visayan Poetry and Literature". Wits and Spirits. Archived from the original on November 27, 2012. Retrieved September 4, 2012. ^ Lent, J. A. (2014). Lent, J. A. (ed.). "Philippine komiks: 1928 to the present". Southeast Asian Cartoon Art: History, Trends and Problems. Jefferson, NC: McFarland and Company, Inc., Publishers: 39–74. ^ Protacio, R. R. (2009). "Gloria Sevilla: The queen of Visayan movie land". ^ Javier-Alfonso, G. (n.d.). "Cesar Montano, a superior story teller". Retrieved 18 April 2015. ^ Ocampo, A. (7 January 2009). "Eartha Kitt's Philippine connection". The Philippine Daily Inquirer. Archived from the original on June 26, 2012. ^ Guerrero, A. M. (10 November 2008). "Let us now praise famous Visayans". The Philippine Daily Inquirer. Archived from the original on 15 May 2011. Retrieved 5 September 2012. ^ Steven A. Henkel. "Tinikling ideas". Retrieved 5 September 2012. ^ Funtecha, H. F. (9 June 2006). "What Ilonggo culture is". The issues on the use of the word 'Bisaya' by Henry Funtecha, PhD The News Today. August 28, 2009 Iloilo City, Philippines.